Visiting Malaysia is a dream come to true for most, however, before you embark on the journey you must apply for a visa. And to apply for a visa you need to meet the Malaysia visa requirements. Most of us have serious doubts about what documents are required for which visa. Consequently, with the joy and excitement of travelling to a different country, comes the trepidation of arranging for visa documentation. Find out more about, if you’re eligible for a Malaysia visa, the visa you require to visit Malaysia and finally, the documents you need to furnish, to obtain that visa. Single entry visa: A single entry visa allows you to stay in Malaysia for a maximum of 30 days. If you obtain a single entry visa, you are required to re-apply for a new visa each time you depart and re-enter Malaysia. Multiple entry visa: A multiple entry visa allows you to stay in Malaysia for more than 30 days. You can depart and re-enter Malaysia numerous times if your journey is within the visa validity period. eNTRI visa: The eNTRI visa is applicable for Chinese and Indian nationals only. You can stay in Malaysia for 15 days and this time is non-extendable. Visa on Arrival: A visa on arrival is a permit to visit Malaysia, granted to you after you have arrived in Malaysia. It is applicable only if you have a valid tourist visa for Indonesia, Thailand or Singapore and are entering Malaysia through any of these countries. Work permits: Work permits are issued for foreign nationals working in Malaysia. They range between 6 months to 5 years. Work permits can be in the form of either long-duration employment passes, temporary employment passes or professional visit passes granted to expatriates. Entry permits: Entry permits are a type of visa that allows you to stay in Malaysia for an extended period of time, with the intention of becoming a permanent resident. The government typically grants these permits to spouses of Malaysian citizens, investors, experts or to professionals in a niche field. Firstly, you must possess a passport. The passport must be valid for at least 6 months after you enter into Malaysia. In special cases, the Malaysian government grants you permission to submit a document in lieu of a passport. You can apply for this document at any Malaysian consulate abroad. You must have a valid visa on you. A visa is a document granting you express permission to enter and stay in Malaysia. Nonetheless, the immigration counter at the entry point has the absolute authority to decide whether or not you can enter Malaysia. On certain conditions, a visa on arrival is also granted to citizens entering Malaysia from Indonesia, Thailand or Singapore. There must be sufficient funds on you when you arrive in Malaysia, this is to prove you can maintain yourself and any dependant with you in Malaysia. You must also possess a valid return ticket to your home country. The Malaysian government has guidelines in place prohibiting the entry of specific individuals in the country. They include convicts, illegal immigrants, contagious persons, individuals with no means of sustenance etc. You must complete an arrival/departure card when you enter and leave Malaysia. It is necessary to submit this card along with the passport and visa at the immigration counter. Lastly, if you wish to work in Malaysia, or are entering the country with an intention to get permanent residency, you must have a sponsor. For married couples, one of the spouses is usually the sponsor and for professionals, the company they work for act as sponsors. The type of visa you need to get to Malaysia depends on the duration and purpose of your stay in Malaysia. Some visas require an inquiry and additional documentation by the Immigration Department of Malaysia, such visas are called Visa with Reference. These visas are granted to spouses of Malaysian citizens, professionals, investors, expatriates and students. Conversely, some visas are granted without much inquiry, these are called Visas without Reference. They include tourist, social visit and eNTRI visas. We consulted our friends at evisamalaysia.in, and they were kind enough to send us the following image. This is a great snapshot of all the requirements when applying for a Malaysia visa online. Do note, that the pricing they have mentioned at the bottom of the image is a 10% mark up over the Malaysian Government mandated fees for their services to apply for a visa on your behalf. To apply for a student visa you firstly need a support letter from the Ministry of Education. You require the Offer / Acceptance letter from the educational institute where you plan to pursue your education. Two sets of the form Imm.14, provided by the Immigration Department of Malaysia. Those students who wish to transfer university/college, need a release letter from their previous university/college, as well as their attendance reports and academic performance reports. To apply for an entry permit, individuals who come under the category of investors, professionals or experts, need the following documents in addition to the visa and passport. The photograph must be in front of a white background. It must be a studio photograph. The guidelines do not allow selfies and cropped pictures. Figuring out what documents you require, arranging them and formatting them into the specified guidelines, is a huge trouble. 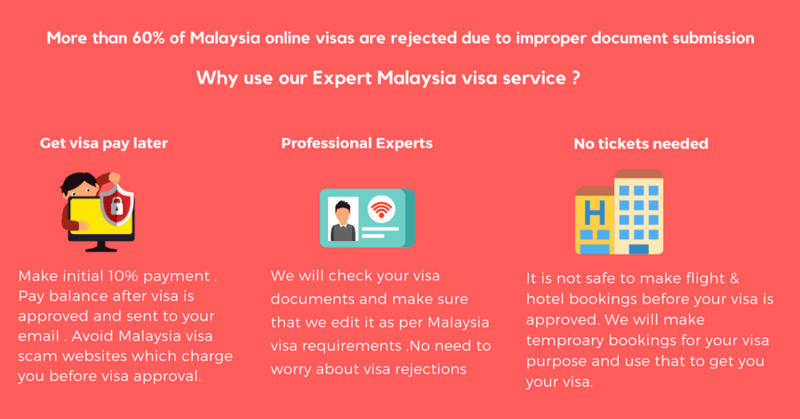 Minor mistakes lead to visa rejections, to avoid this take the help of evisamalaysia.in to sort out your travel itinerary for you. If you are planning to visit Malaysia as a tourist or for a short social visit, an eVisa might be your best bet. Apply for an eVisa to Malaysia without any tension through evisamalaysia.in. Receive your visa in your email after approval from the Malaysian government. What is the photograph size for Malaysia visa? 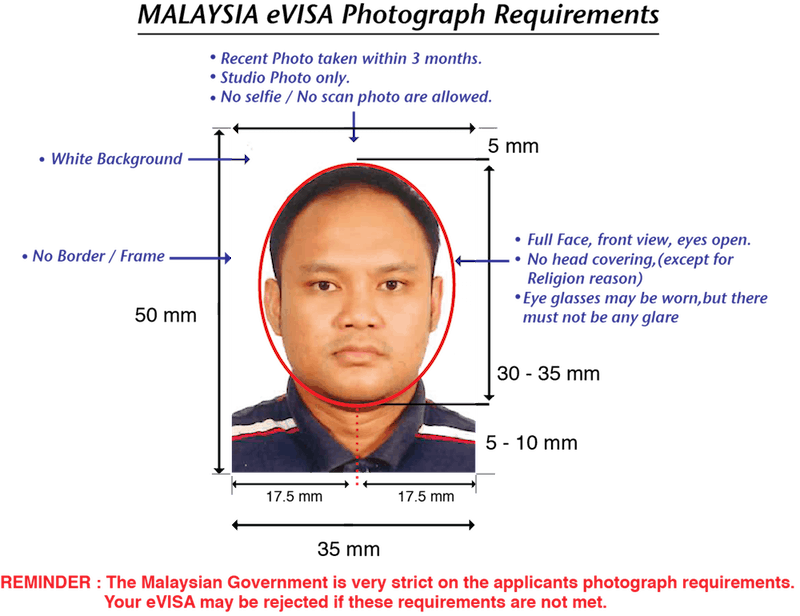 According to Malaysia visa requirements, you need to submit a photograph of size 35 mm X 50 mm. The photograph must be taken in front of a white background. Your face must be visible in at least 3/4th of the photograph. Do I need to show bank statements to apply for a Malaysia visa? Yes. A copy of your bank statements, showing sufficient deposit, is required as proof that you are capable of sustaining yourself in Malaysia. Also, if you are applying for a visa on arrival, you should have a minimum of 1000 USD in your bank as a deposit. Do I need a sponsor to apply for a work permit? Yes. For work permits, employment passes and entry permits, sponsorship from a Malaysian citizen is necessary. Nonetheless, for a work permit, it is sufficient if the company or organisation where the person works submits a letter to the government taking responsibility for the foreign employee. What documents need I submit for visa on arrival? A valid visa for Indonesia, Thailand or Singapore. Bank statement showing at least 1000 USD in deposits. A confirmed return ticket to your home country. Apart from these documents, you will need to pay a processing fee of 100 USD to avail the visa. What is the application procedure to obtain Malaysia visa? And finally, confirming or rejecting visa applications. Due to the stringency of the document check and strict adherence to format, it is advised that you opt for evisamalaysia.in while applying for the visa. How do I make payment for a Malaysia visa? If applying online you can make payments through online banking, credit cards or your PayPal account. For manual visa applications, you need to deposit the payment at the Malaysian visa consulates. What is the minimum age to work in Malaysia? You can only obtain a Work Permit / Employment Pass if you are more than 27 years of age. However, this age limit is reduced to 23 years if you work in the IT sector. Do I need to submit my original marks sheet to get a student visa to Malaysia? No. A copy of all the performance records is sufficient. You need to, however, submit the original acceptance letter from the university/school in Malaysia where you are planning to study.